Weasels, scientifically carnivores of the genus Mustela, come in a range of sizes but one basic shape: long and thin. In total, about 17 species exist, most of which are commonly called weasels, although the genus also includes polecats, stoats, black-footed ferrets, and one of the two remaining species of mink. They mostly subsist on a diet of small rodents, making them an asset to gardeners and farmers. The various species of weasel are widely distributed across Asia, Europe and the Americas, although they are absent from Oceania and most of Africa except as introduced species, usually feral ferrets. In North America, the Mustela species commonly referred to as weasels are the long-tailed weasel (Mustela frenata) and the least weasel (Mustela nivalis), both of which are widely distributed. The least weasel stands out as being the smallest carnivore in the world, reaching a maximum length of 8 inches and weighing no more than 4.5 ounces. 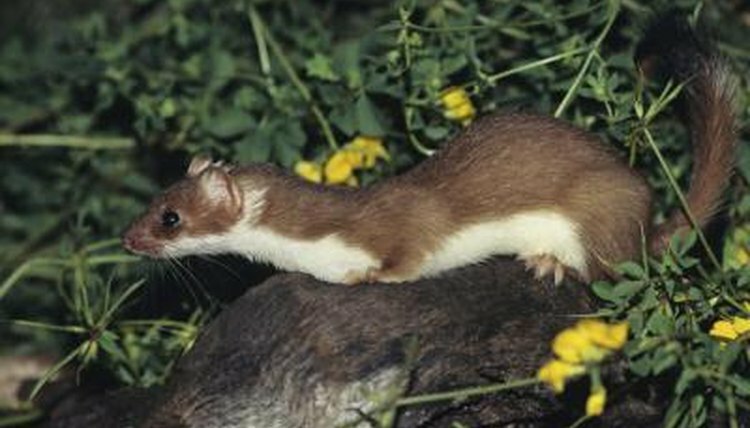 Also known as ermine, stoats (Mustela ermine) are native to much of North America, Asia and Europe and have become a nuisance as an introduced species in New Zealand. Their coats become thicker, silkier and pure white in winter, and as a result the fur was once valued. Unlike other mammals with valuable fur, though, the stoat is in no danger whatsoever, with the species being plentiful throughout its wide range. The two species of polecat—the steppe polecat (Mustela eversmanii) and the European polecat (Mustela putorius)—are comparatively large animals, growing to about 20 inches excluding tail. The European polecat is the ancestor of the domestic ferret, the only Mustela species to have been domesticated. Endemic to North America, the black-footed ferret (Mustela nigripes) was pushed to the edge of extinction in the 20th century, and by 1987 the species was classed as “extinct in the wild.” Intense conservation efforts, including reintroduction programs, have brought the species back—though with only about 250 wild individuals, the black-footed ferret is still endangered. The European mink (Mustela lutreola) belongs to the same genus as the other weasels and, despite a superficial similarity, is not particularly closely related to the American mink (Neovison vison). The European mink’s range is now restricted to a few spots in France, Romania, Russia, Spain and Ukraine, although it used to be far more widespread. This species is critically endangered, primarily because of over-exploitation, habitat destruction and competition with the introduced American mink, and numbers are still dropping.